The chronological order of the email and the attachments is maintained. The body of the email is printed first and then its attachments. The software waits that the current printing job has finished before sending a new one, thus maintaining the correlative order. You can print PDF files, Office documents and images. You need to have Office installed for printing Word and Excel files and Adobe reader installed for printing PDF files. 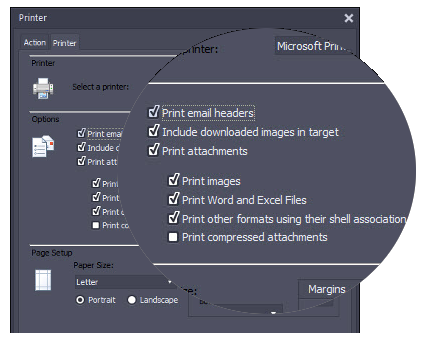 Attachments that are compressed inside a ZIP file can be extracted and printed as well.